1999 Pokemon Base 1st Edition #32 Kadabra in mint condition. This is the French version which has the "1st Edition" designation printed on the card. Card came directly from pack and placed directly into protective holder and has NEVER been played with! 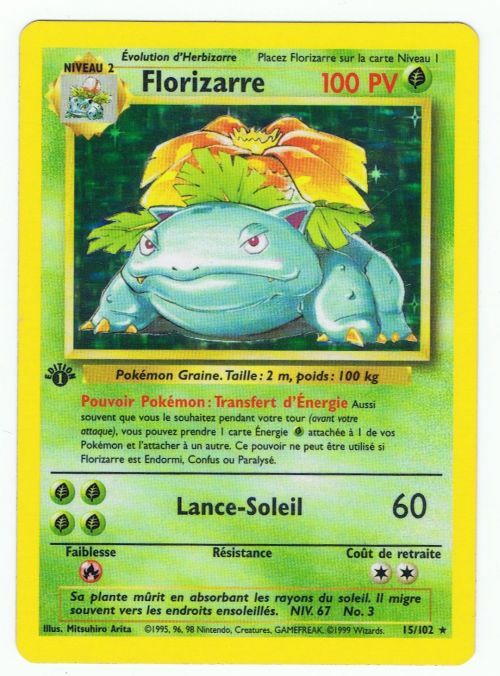 1999 Pokemon Base 1st Edition #44 Bulbizarre (Bulbasaur) in mint condition. This is the French version which has the "1st Edition" designation printed on the card. Card came directly from pack and placed directly into protective holder and has NEVER been played with! 1999 Pokemon Base 1st Edition #45 Chenipan (Caterpie) in mint condition. This is the French version which has the "1st Edition" designation printed on the card. Card came directly from pack and placed directly into protective holder and has NEVER been played with! 1999 Pokemon Base 1st Edition #54 Chrysacier (Metapod) in mint condition. This is the French version which has the "1st Edition" designation printed on the card. Card came directly from pack and placed directly into protective holder and has NEVER been played with! 1999 Pokemon Base 1st Edition #58 Pikachu in mint condition. This is the French version which has the "1st Edition" designation printed on the card. Card came directly from pack and placed directly into protective holder and has NEVER been played with! 1999 Pokemon Base 1st Edition #67 Voltorbe (Voltorb) in mint condition. This is the French version which has the "1st Edition" designation printed on the card. Card came directly from pack and placed directly into protective holder and has NEVER been played with! 1999 Pokemon Base 1st Edition #68 Goupix (Vulpix) in mint condition. This is the French version which has the "1st Edition" designation printed on the card. Card came directly from pack and placed directly into protective holder and has NEVER been played with! 1999 Pokemon Base 1st Edition #71 Recherche Informatique (Computer Search) in mint condition. This is the French version which has the "1st Edition" designation printed on the card. Card came directly from pack and placed directly into protective holder and has NEVER been played with! 1999 Pokemon Base 1st Edition #79 Double Suppression d'Energie (Super Energy Removal) in mint condition. This is the French version which has the "1st Edition" designation printed on the card. Card came directly from pack and placed directly into protective holder and has NEVER been played with!